It has been said that if you cant do it with a .30-06, you probably cant do it. That little saying is likely more right than wrong. It has been over a century since the U.S. Military recalled the (.30-03) M1903 Springfield rifle and modified it to accept the .30-06 in the form of the M1906. The most popular hunting cartridge in North America has spawned numerous variations, being necked up in the form of the .35 Whelen and necked down as in the 25-06, with the .270 Winchester perhaps the most successful of its many offspring. Compared are a pair of .30-06 bolt guns, the latest incarnation of the highly refined Savage long action and the latest walnut model of the recently introduced Marlin XL-7 rifle. If imitation is the greatest form of flattery, the Marlin profusely flatters the older Savage 110 action, but there are salient differences between the two as I was soon to discover. 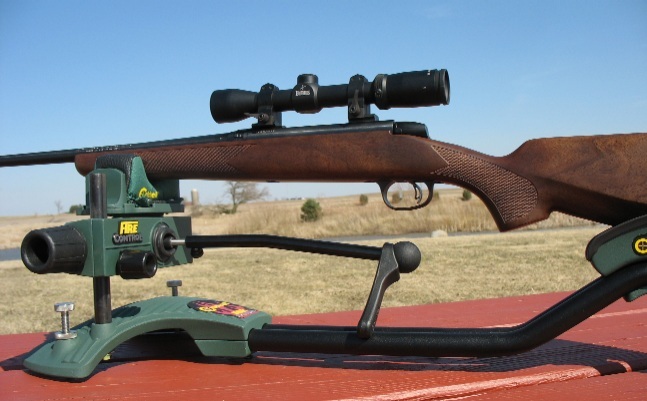 Marlins re-entry into the bolt-action center fire arena is essentially a copy of the Savage round front, flat rear basic long action integral magazine bolt action rifle right down to the barrel nut. Presented as an economy rifle, this new blued / walnut version is a slightly upscale but still few-frills model; the walnut version is apparently a deluxe economy model. It just begs for comparison to the Savage. The Marlin is pillar-bedded as in the traditional Savage. Where we would expect the Marlins barrel to be floated right out of the box, it wasnt. The XL7s barrel had heavy contact with the wood on the left side, firmly riding the left rail of the inletting. The satin-finish walnut stock was, as you might imagine, fairly plain. While we expected a metal trigger guard in a slightly upgraded XL7, we found plastic. Though scope bases were supposed to be included with this rifle, they were notso we bought a pair of matched Warne steel base set (Warne #M902/924G) so we could mount a Burris 2-7 x 35 Fullfield II scope along with Warne Maxima rings. The Marlins Pro-Fire trigger also pays a bit of tribute to Savage Arms. With a flap in the center, it may look like an Accu-Trigger but is more related to the Glock treatment. If an Accu-Trigger is pulled without pulling on the triggers center properly, the Accu-Trigger decocks without firing. Marlins Pro-Fire Trigger is frozen until its center flap is pulled flush; it will not harmlessly decock. It exhibited a small amount of creep, but not much, breaking at 3-1/2 lbs. out of the box. It is a good hunting trigger, actually quite a bit better as supplied than recently tested Remington and Ruger bolt-action triggers out of the box. It isnt as crisp as Savages Accu-Trigger, but nevertheless we feel most hunters will be quite happy with it. The bolt handle knob of the XL7 is noticeably smaller than that found on the more substantial Savage bolt. Whether that is significant is largely up to the individual. We feel the Savages bolt is easier to operate with gloved hands. The Marlins fluted bolt is not as attractive to the eyes as the Savages jeweled bolt. Despite that, we felt that the fluting did reduce some drag as claimed by Marlin, making it a tad smoother than the jeweled bolt of the Savagethough the Savage bolt is hardly difficult or rough by comparison. That is working the bolts with no ammunition. When actually loading, extracting, and ejecting brassthe Savage action proved to be a bit smoother. The bolt on the Marlin does not lock closed, though, as the Savage bolt does (with Savages three position safety). The Marlin bolt can be snagged open when navigating through heavy cover, while the Savages bolt is locked closed. Further, the Marlins two-position safety is noisy compared to the whisper-quiet operation of the Savage safety. Both of these Marlin qualities are negatives, in my opinion. 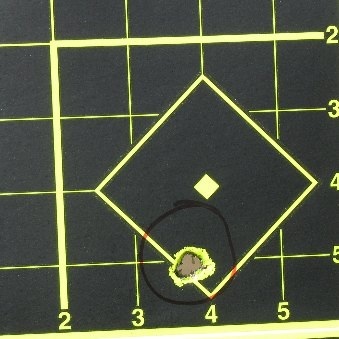 At the range, we noticed that the Marlin XL7s ejection was adequate, but weak compared to the Savage. The spent brass softly dribbled out and dropped beside the action. We had no failures to eject at the bench, but were less that totally confident with the soft, anemic way that this XL7 ejects spent brass. We compared the Marlins Soft-Touch recoil pad to the Savages P.A.D. recoil pad at the range, alternating rifles between shots using the same ammo. We agree that the Marlin pad is a real recoil pad, certainly more effective than rubber buttplates and most generic pads. It did not compare well to the Savage P.A.D recoil pad, though. We unanimously found the Savage to be far more comfortable to shoot than the Marlin, with less muzzle jump and a noticeably softer recoil pulse. A half box of the Winchester 180 grain XP3 ammo left our shoulders stinging and going numb from the Marlin; not so with the Savage 111. The Marlin XL7 wasnt particularly wonderful at anything, but it wasnt horribly bad at anything, either. It has a better than average price-point, a better than average trigger, and a better than average recoil pad. The rest of the rifle fared average in performance, or below average. It was less than average in the accuracy department, and it suffered by comparison with the Savage 111FCNS with the noisy safety and floppy bolt being particular areas we didnt like, it all coalesced together to form a slightly below average .30-06 Springfield bolt-action. Despite the couple of promising spots (trigger and recoil pad) it is an immensely forgettable rifle. Building upon the prior advances and innovations to the Savage bolt action center-fire line comes the newer 111FCNS model. In addition to the well-known, well-respected Accu-Trigger, this Savage long action includes the smooth invisible barrel nut with no visible notches, the nested in front of the trigger guard bolt release, the Savage P.A.D. recoil pad, and the latest center feed Savage detachable magazine. Perhaps the most interesting of all features is the Savage Accu-Stock, and integral aluminum bedding block that according to Savage provides three-dimensional bedding that grips the entire action prohibiting movement in all directions, while retaining the factory free-floating barrel array that Savage is known for. Out of the box, this Savages Accu-Trigger broke at a very crisp 2 lbs, 7 oz. with no take-upand outstanding trigger. Weaver style aluminum bases were already mounted; we added a Sightron SI 3-9 x 40mm scope attached with Warne Maxima medium height steel rings. As previously mentioned, the barrel was perfectly floated so it was off to the range. We were very pleasantly surprised at how well the P.A.D. recoil pad attenuated recoil. These days, it seems that most everyone has a recoil-pad bragit is amazing that the worlds greatest recoil pad has been invented some ten times simultaneously with totally different designs by different companies. 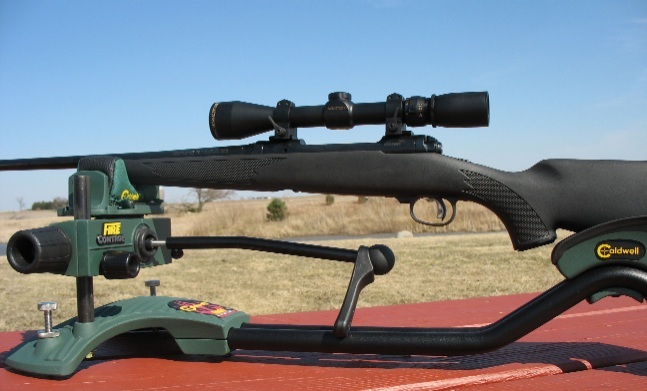 Well, many of the new wonder pads have proved to be not-so-wonderful, like the not so super Remington Supercell recently tested in the course of a rifle comparison. Well, the Savage P.A.D. does an impressive job at softening .30-06 recoil. We are also surprised that, even though Savages recoil pad is remarkably effective, it does not even rate a mention in the companys current catalog. The P.A.D. is available only in Savages synthetic-stocked models, not in Savages Classic walnut and other wood-stocked offerings. The same is true of the Accu-Stock as wellas the thermoplastic stock appears to be molded around the Accu-Stock bedding rail assembly, it is not offered in conjunction with walnut or laminate stocks that we know of. Going down the line, we found that this latest Savage got a lot of things right, doubly so when compared head-to-head to the Marlin. We found the Savage Accu-Trigger to be crisper with less take-up than the Marlin trigger. We preferred the Savages metal trigger guard to the plastic of the Marlin, we liked the more generous bolt handle knob of the Savage, we felt Savages factory recoil pad did an excellent job and a better job than the Marlins pad. We appreciated that the Savages barrel was properly floated out of the box, where the Marlins barrel was not. We appreciated the stronger ejection of brass from the Savages bolt head compared to the Marlin offering. Savages center-feed detachable magazine made the Savage faster and easier to load and unload than the Marlin. The Savages safety was quieter than the Marlins, and the Savages bolt properly locked closed where the Marlins could not. The Savages action, with its invisible barrel nut and jeweled bolt was more attractive than the respective Marlins counterparts. One of the things that we have felt could be improved with the flimsy factory Savage thermoplastic stocks is the visible mold line that runs all the way around it. It is an eyesore, albeit a small one. While the picky owner can sand it smooth, it does not go along with the excellent fit and finish of the rifle. We feel that Savage can, and should, give us a well-finished stock without prominent mold lines that better reflects the otherwise exemplary build quality of the rest of the rifle. This Accu-Stock does not address the eyesore of the visible mold-line. The Savage Accu-Stock deserves a bit more coverage. Does the Accu-Stock work? Well, thats a question that isnt easy to quantify. To the extent that it firms up the generally flimsy standard Savage thermoplastic stocksyes, it certainly does that and thats a good thing. And yes, this Savage is an excellent shooterparticularly considering the standard sporter-weight barrel profile. The Savage 111 clearly outshot the Marlin XL7 in this match-up. Savage calls this aluminum rail system far superior to glass bedding. We cannot find any basis for that dramatically overly-optimistic ad-brag. We have run into the eternal question many, many times before as in How much will hand-bedding improve the accuracy of my rifle? There can be no answer given to this with any exactitude. We can say that we have never seen a properly executed bedding job hurt anything, but it does not always help things in a measurable way, either. This leads into the various and sundry exotica that aftermarket companies are sometimes created from: over-size recoil lugs, action truing, cryogenically treated barrels, and on it goes. No stock is going to turn surplus ammo into match grade ammo, no stock is going to make your scope hold zero any better, or make you a better shot. All rifles remain individuals to agree, and all rifles we have seen are a bit unique, generally favoring one or two loading more than others for combinatorial reasons that can been answered the same way as How many angels can dance on the head of a pin? Weve had too many rifles, and too many Savage rifles in particular shoot spectacularly well without the Accu-Stock or hand-bedding of any kind (including a Savage Model 25 Classic Sporter) to carte blanche buy into the notion that the Accu-Stock is always a game-changer. At the same time, we do appreciate the way the Accu-Stock system adds rigidity to this stock, and given our druthers we would likely rather have an Accu-Stock than not. Just like many other hand-bedding and stock-bedding approaches, it may help a lot or it may not help at all in any measurable sense. Weve not seen properly done hand-bedding hurt anything. While the Accu-Stock may not always help in a big wayin the same vein, we cant see that it would hurt anything, either. Rather than describe the Accu-Stock as revolutionary and a three-dimensional bedding system we have a more down to earth view of it. Aluminum chassis and aluminum bedding block type stocks have been around for some time. 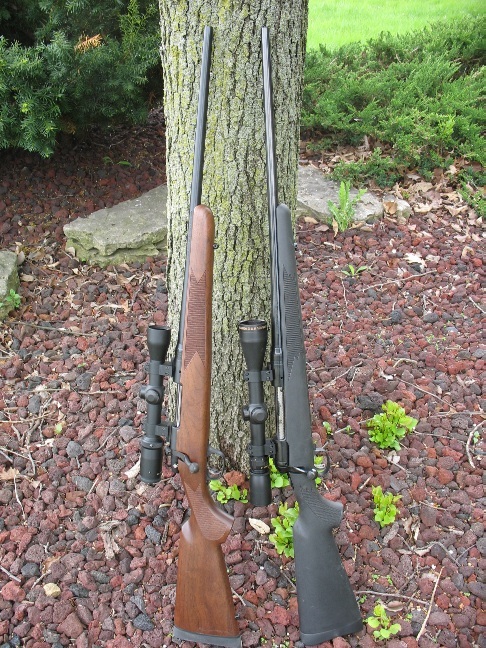 They are effective ways to attach a barreled action to the stock: some of the well-regarded H-S Precision stocks run in the neighborhood of $350 street price. What the Accu-Stock does, primarily, is stiffen up the factory Savage center-fire stocks that historically sorely needed more rigidity at far less cost to the consumer than many aftermarket options. 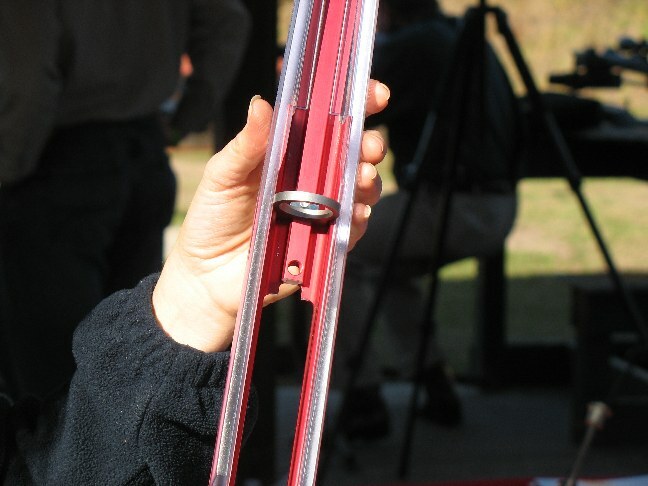 One of the approaches in accurizing the Savage (and other brands of rifles) is to use an oversized recoil lug, or to glass-bed the stock in particular in front of and behind the recoil lug. The Accu-Stock has a wedge screw that locks the recoil lug in place. While a different approach, the outcome is very similarit reduces or eliminates the barreled action movement in the stock. In the case of low or moderate recoil chamberings we would not expect much, if any, change in performance. So, a fair assessment of the Accu-Stock is referring to it as the basic aluminum chassis approach, with the novelty of being able to mechanically lock the recoil lug in place by means of a dedicated wedge screw. We feel it does stiffen and substantially improve upon the older Savage Tupperware stocks. It will reduce any perceived need to go aftermarket for many shooters, in the same way that the Accu-Trigger has eliminated trigger work and trigger replacement for many shooters. While we consider the Accu-Stock a welcome and tangible upgrade to the Savage standard plastic stocks; we do not feel it elevates the stock to the level of the better composite stocks, like a McMillan for example, nor can it equal much less surpass hand bedding. As a factory stock, it is of course now better than most of the competition (likely the idea) and we consider it comparable to a Bell & Carlson Medalist series type stock as a general barometer. We appreciated the accuracy, the Accu-Trigger is as superb as ever, the treatment of the bolt release and barrel nut is elegant, and the Savage detachable magazine was easy to load, pop into place, and remove. We were enjoying a strong combination of best of breed attributes, and the weakest link (of this model, the stock) has been substantially upgraded and stiffened. Even the new Savage recoil pad ranks with the best in the industry. But, we had a complication. On or about the 150th shot fired through the Savage, the pistol grip cap suddenly broke off. In no way did it affect performance, and we could not characterize it as an issue that could jeopardize a hunt in any way. Nevertheless, it happened and we need to report it. Now the question goes back to the quality of the company, and their commitment to customer service. Confidence in the company is a huge reason to consider a purchasecustomer service sells rifles, in our view, far beyond the too easy to generate ad-brags and bluster. All warranties are the about the samethat is, of course you actually need to employ your warranty. Then things can change, and change in a big hurry. Weve seen this over and over again, inclusive of recent reviews where management of firearms companies ignores the service after the sale (Beretta, Stoeger) and companies that just plain do everything reasonable and respond quickly. We are writing for the guy that pulls the trigger here, and no one else. A recent S & W recall of pistols produced for no less then seven years (20022009) suggests severe company ignorance and lack of addressing an issue for far more than a reasonable period of time. At the same time, our experience shows that reputable companies like Savage Arms, Browning, and Ruger do everything reasonable to address issues whether isolated or as a result of the perfect storm. Again and again, the team assembled by Savage has stood very tallheaded by Customer Service CEO Joe DeGrande and his team. We have found that the longest warranties are rarely the best. Sturm, Ruger, & Company and Browning Arms (to cite two prevalent examples) have no written warranties at all but both are extremely responsive. We are hardly afraid of giving credit where credit is due nor assigning discredit where discredit is due. This non-critical issue has been candidly reported. The Frisbee Savage grip cap syndrome is a new one for us. Savage did replace the stock without hesitation, and we are quite satisfied with that simple resolution. Velocity testing was conducted at 42 degrees F. ambient, using a CED M2 Chronograph with the first sensor located 15 feet from the respective muzzle. Elevation was 500 feet above sea level. For the accuracy testing, wind was variable from 11-17 mph; our targets were set up at 100 yards. Three-shot groups were fired off of our Caldwell Fire Control Rest. The Savage gave us better velocities and lower standard deviations with all of the test ammunition. 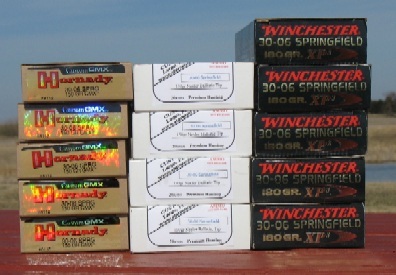 The Winchester Supreme 180 grain CX3 ammo performed horribly in both rifles, producing nothing we could really call groups. The Hornady 150 grain GMX ammo performed superbly in the Savage, as did the 150 grain Nosler Stars & Stripes loads. In the Savage, the standard deviation for the Hornady ammo was an astonishing 0.816 fps. The best group from all of the range testing was right at 1/10th of an inch out of the Savage with the Stars and Stripes ammunition a feat we did not repeat. Clearly, the Savage shot the lights out of the Marlin. 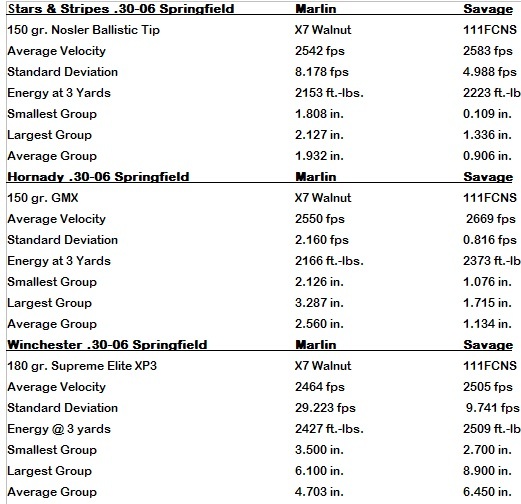 It was no contest, with the Savages average group sizes (with the two loads that grouped) averaging less than half the size of the Marlins attempts. The Savage, out of the box, was essentially an MOA .30-06 Springfieldactually a bit better with the Stars & Stripes rounds. The best Savage group, a stunning one tenth of one inch CTC 5 shot group @ 100 yards with Stars & Stripes 150 grain Nosler Ballistic Tip ammo: fabulously good, if not amazing with a hunting rifle. The Savage 111FCNS .30-06 Springfield was easy to use, comparatively comfortable to shoot, easy to operate and easy to shoot well. The 111FCNS gave us a new, excellent recoil pad and a hassle-free magazine design to compliment its typically excellent Accu-Trigger. The attention to detail in the form of the generous bolt-handle knob, invisible barrel nut, unobtrusive bolt release and quiet safety complete an excellent all-around hunting package. It is, in its current form, the best rendition of the Savage factory synthetic / blued sporting rifle ever. This latest, enhanced example of the Savage long-action comports to the long-established grading scale of functions perfectly, shoots accurately, and exhibits comfortable, easy use for its owner. This Savage is a big winner: one of the most accurate centerfire hunting rifles I've ever tested. If you can't do it with this Savage, well, like the saying goes . . . then you probably can't do it.